Hidden in the depths of the Grand Canyon is a group of waterfalls that are said to be some of the greatest on this planet. Imagine towering waterfalls over lush, orange canyons dumping into mystical pools of the most aqua-blue water you’ll ever set your eyes on. 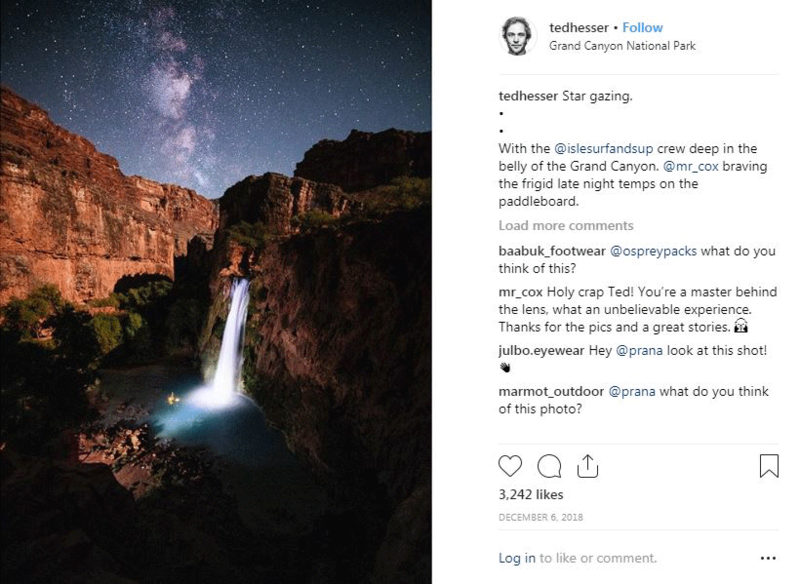 You’ve probably seen breathtaking photos of the falls on social media, but until you’ve experienced them in person, the pictures can’t tell the whole story. 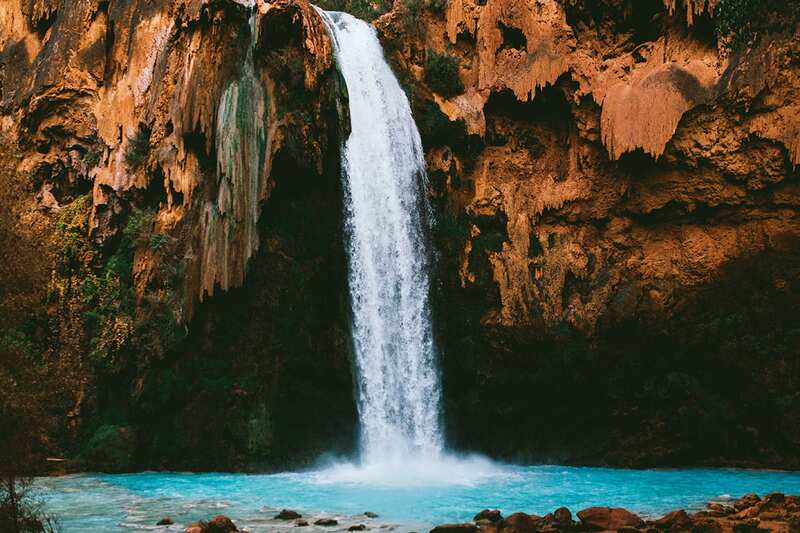 The falls are named after the Havasupai Indian tribe that live on the reservation where the waterfalls are located. A small group of indigenous people arrived there centuries ago and carved out a simple lifestyle that continues to this day. There are five main waterfalls that thrive among the reservation – Fifty Foot, Navajo, Havasu, Mooney and Beaver Falls. All five make up Havauspai Falls. After hearing about how amazing the waterfalls were, the ISLE team knew what we had to do – paddle board Havauspai Falls. But, before we could even think of doing that, we needed to find the one thing we were missing – a wise, English speaking bighorn sheep to lead us the correct way to the falls. Just kidding! We were missing a permit. Today, the most challenging part about going to Havasupai Falls is not the nine-mile hike in, but acquiring a permit, which has become almost impossible to do because permits sell out every year. 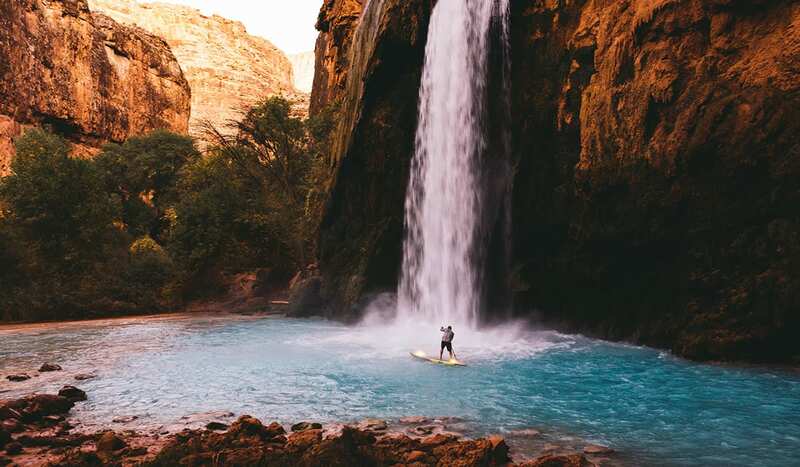 It seemed like this trip would never become a reality, until one summer day in the office, our good friend Rich called us with an offer we couldn’t resist – four permits for Havasupai Falls in November. Game on. 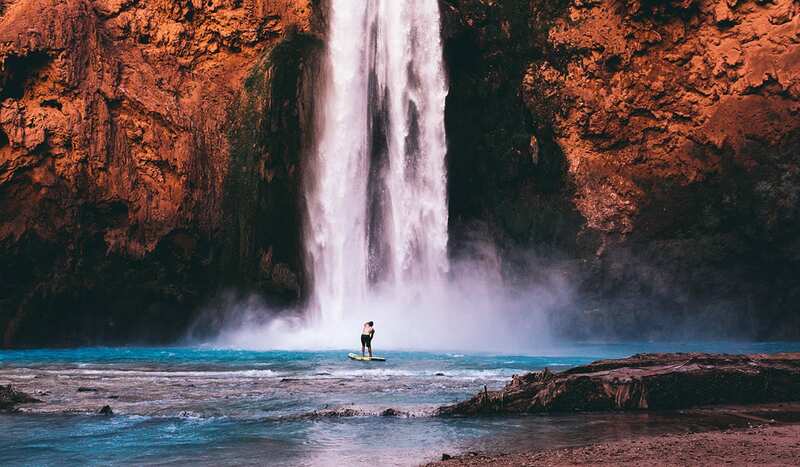 The mission: Paddle board Havasupai falls with a crew of creatives with the goal of scoring some insane footage for your viewing pleasure. We had four spots available in our crew. Three of the spots were no-brainers since myself (Doug), Austin and Brandon were a part of the creative team at ISLE. 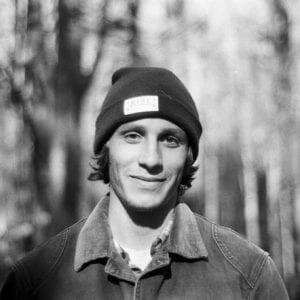 After much thought, the fourth spot was filled by wildcard, Ted Hesser. In August, we called Ted to see if he would be interested in coming, and obviously, he couldn’t pass up the offer. 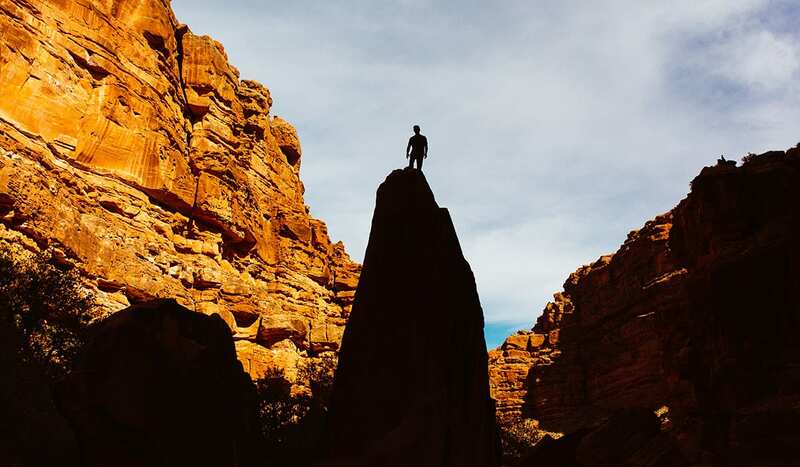 Our trip was planned to be three days long – two nights camping at Havasupai Campground and one day hiking back. 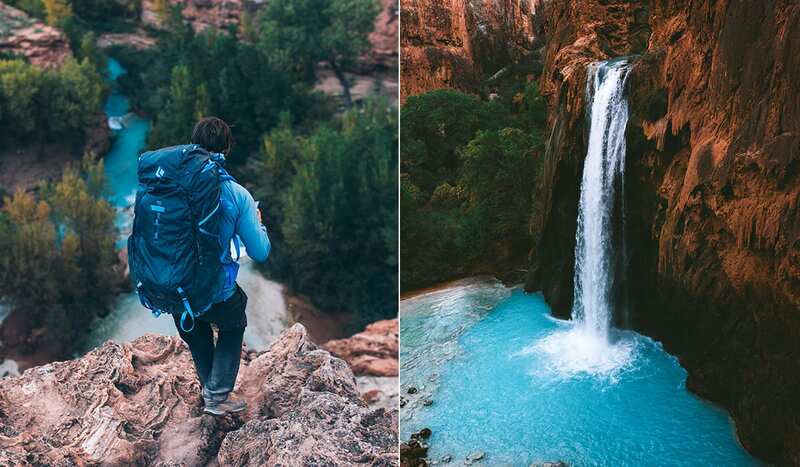 The hike to Havasupai Falls is no walk in the park. It’s about a nine-mile hike in, making it an 18-mile round trip. It’s too far of a trek to do an appropriate day hike, and honestly would not allow you to have enough time to enjoy all the waterfalls. If you’re feeling inpatient or boujee, you can take a helicopter from the trailhead which will get you there in three minutes. Waking up on the Havauspai Trailhead was cold. It was 7am and the sun had just begun to rise over the canyon. We could see our breath in Austin’s van, where we’d all crammed in for the night to sleep. It was 22-degrees and sunny outside. You’d think the Grand Canyon would be warm year-round because it’s a desert, but that’s not the case. The Grand Canyon has a semi-arid climate which means summers are hot and winters are cold. November is the start of the Grand Canyon’s winter, so we were looking at a low of 20 degrees at night and a high of 60 degrees during the day. The nine-mile hike to Havasupai falls did not intimidate us but camping in the 20-degree weather did. This became more of concern for Ted because he woke up sick. “Guys, I’m sick.” Ted faintly admitted while we were all organizing our packs. I took a better look at Ted when those words left his mouth. His face was pale, eyes glossy and simply just looked sick. Hiking for nine-miles and sleeping in freezing temperatures was not the cure to Ted’s cold, but the complete opposite. We discussed canceling the trip, but Ted told us he only mentioned this just to let it be known – the trait of a good crew member. This put things into perspective for us as we prepared to start the hike. If this whole trip was going to be a success, we all needed to be open and honest with one another. We finished gearing up our packs with food, extra layers, camera gear and an ISLE Explorer Paddle Board and set off on the trail. In around six hours we would be arriving at Havauspai Falls. The beginning of the hike was the most strenuous. Switchbacks led us down to a vast gorge in the Grand Canyon, beautifully lit by the rising sun. Once we reached the floor of the canyon, the hike remained rather flat. 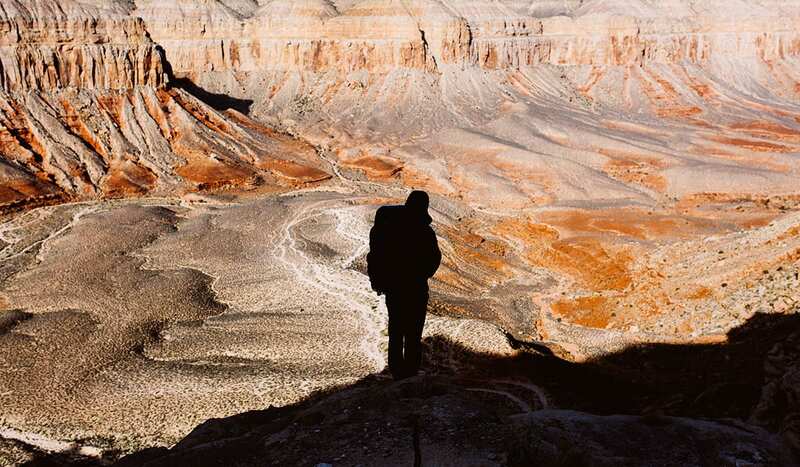 The canyon’s gorge was full of surprises, despite its flat desert landscape. Talking with other hikers on their way back to the trailhead, we learned that following this canyon would lead us directly to the falls. Aware of the monotony that lied ahead, we got weird in the desert, like most should. 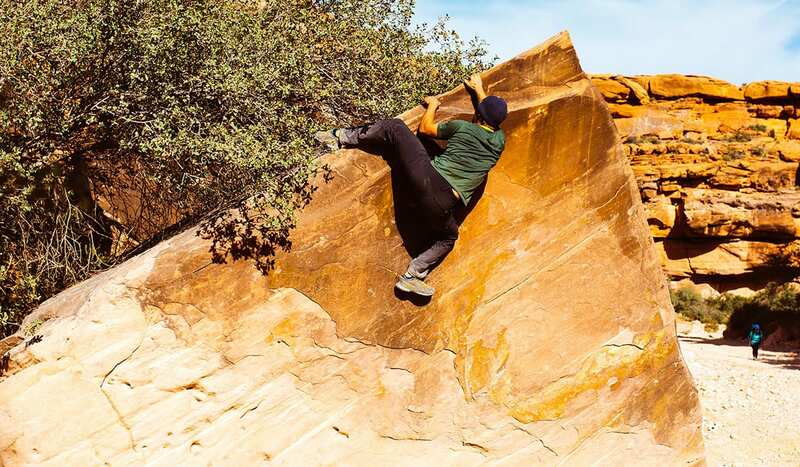 Ted climbed a few boulders like an orangutan, wrapping his arms and legs around faces we didn’t think were possible. Brandon and I hobbled around rock formations like geologists, capturing interesting angles and compositions of the massive, sun-drenched cliffs that surrounded us. Austin packed way too many nuts in his pack and proceeded to make us catch them in our mouths. Austin was the QB and we were the wide receivers. During all this desert activity, Ted ate a record-breaking amount of clementine’s for vitamin C and drank enough water to supply a small village. His snot levels were high, and the desert acted as Ted’s endless box of tissues. So far, the desert was good to Ted. As our feet stomped along the dusty trail, many meaningful conversations were had about life between the whole crew. Dali Lama quotes were recited, and our minds were buzzing with new philosophies on how we could improve our lives. Like any long hike, we realized how small we are on this massive planet as our eyes scaled the towering canyons above us. And just when we thought we’d discovered a new meaning to our lives, we saw a clearing in the distance. Five hours into the hike, the canyon’s gorge gradually opened to a flat, lush landscape that seemed to be a small village. At the time, none of us knew that people still lived on the reservation. As we continued further into the village, it became apparent that there was an entire Indian tribe sustainably living in the middle of nowhere Grand Canyon. We continued into the village, passing by small homes and ranches that looked abandoned. The windows of homes were boarded up and yards were covered with trash. Shortly after, we came across what seemed to be the center of the village were the people of Havauspai were going about their daily lives. Tribe members were sitting on benches having casual conversations in a foreign language, more powerful looking tribe members were traversing across the reserve on horses and tons of cheerful children were running around the grounds, fueled by their young energy. 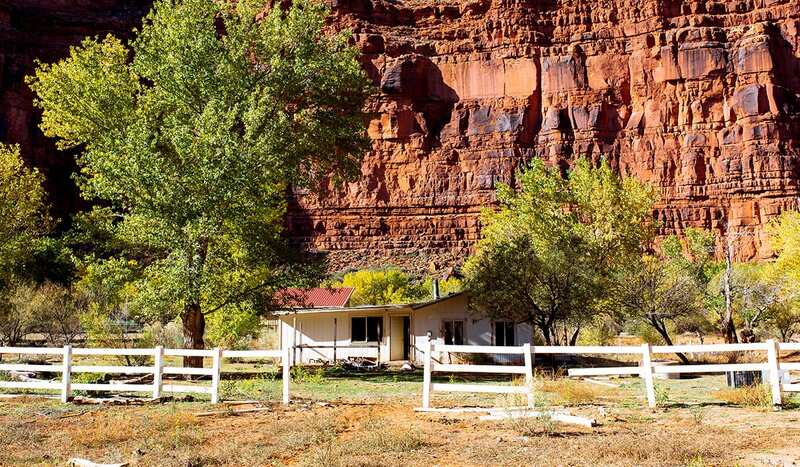 Around most corners you’d find dogs and horses basking in the sun or lying in the shadows of the massive, quaking aspen trees that surrounded the plot of land. Was this paradise? As we hiked through and observed this newly discovered modern-day American Indian tribe, we couldn’t help but be in disbelief. How did a place like this exist so deep within the Grand Canyon? The reserve had to be hours away from the nearest road or town. None of the guides we read online or people we talked to mentioned that we would be hiking directly through an Indian tribe’s home. 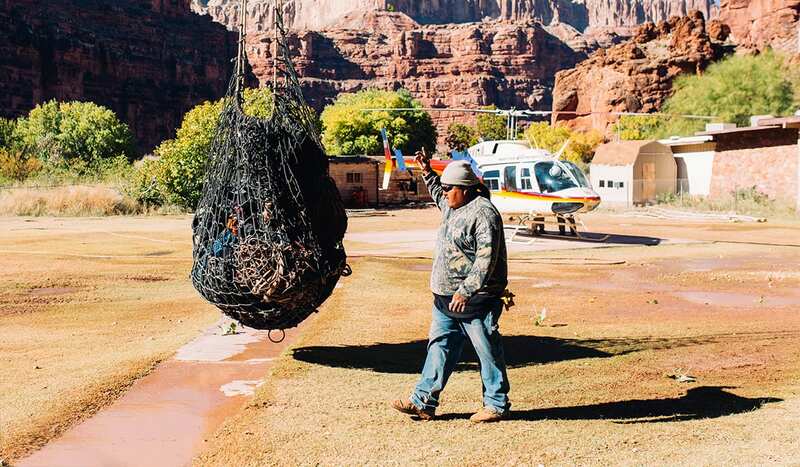 It begged the question – how did the Havasupai people feel about a couple hundred people hiking through their home every month to see their waterfalls? From our experience, they did not take too kindly to us. And by us, I mean all the through hikers. The whole crew would agree that we all felt like we were invading their privacy. Most of the Havauspai people ignored our existence as we trekked through. And for those who didn’t ignore us, gave us some nasty stares. We got the memo. Out of respect, we kept moving forward. We did our best to keep our camera usage to the minimum during this because we understood that sacred places like this should not be disrespected with too many photos and videos. 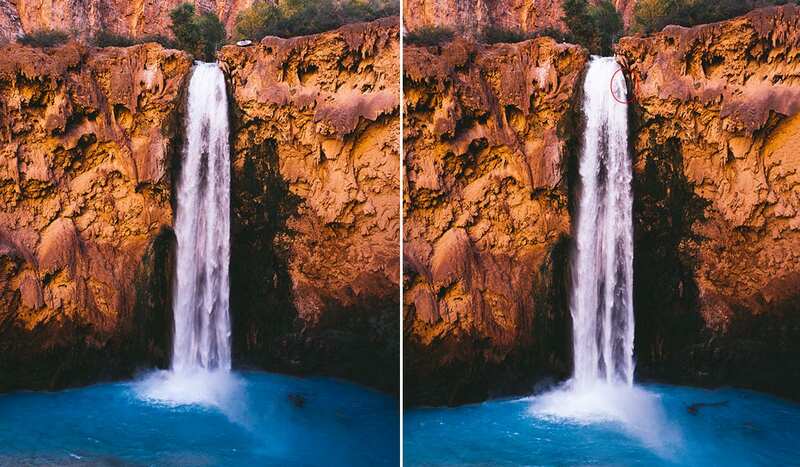 Once we passed through the reservation, we knew we were near the first waterfall on our list, Havasu Falls. Only five minutes past the village, we heard running water. We hiked along Havasu Creek, running wild with beautiful, aqua-blue water. It was hard to keep our eyes off the creek – the color of the water was unlike anything we had ever seen. If it was 10 degrees warmer outside, we would’ve been splashing around in it. One more mile and a few conversations later, we had made it to Havasu Falls. Such a dry, monotonous landscape quickly became a scene from Jurassic Park. Excited as can be, we climbed to the top of the falls and watched Havasu Creek cascade over the Grand Canyon into an aquamarine pool. We made it. Overwhelmed with beauty, we all took a moment to let the mist from Havasu Falls brush against our skin and reflect on our nine-mile hike in. Havasu Falls sure was gorgeous, but we had work to do. We only had two hours left of daylight and needed to shoot photos and video at Havasu Falls. Luckily, Havasupai Campground was directly next to the falls. We found a modest campsite that would be a close hike back, grabbed our camera gear and the Explorer Inflatable SUP and made our way to Havasu Fall’s basin where Austin would go paddle boarding. The basin of Havasu Falls was roaring. Standing at the bottom of the falls, we discovered more details. The canyon the water fell from was a conglomerate of sculpted rocks coated with dark green plant life. The entire area surrounding the basin was drenched from the dense mist created by the impact of gallons upon gallons of water crashing into the basin. It was time to go paddle boarding…well it was time for Austin to go paddle boarding. This was the least attractive job in our crew since the temperatures were dropping significantly. Paddle boarding in 20-degree weather wasn’t ideal, especially when you’re repeatedly getting drenched by the falls’ mist. Cameras were on and we were ready to roll. Austin descended into the basin and everyone else took their position with camera’s in hand to capture an interesting angle of Austin paddle boarding the falls. Ted, hiked to the top to capture a pulled back shot, and myself and Brandon stuck around the basin capturing some more intimate shots. Austin navigated his way around the force of the falls making for some epic photos. We were stoked. However, we soon realized that we were not the only ones stoked. I looked up and saw a crowd of hikers peering over the canyon in every direction like a heard of Bighorn sheep. Everyone’s phones were out recording Austin taking on the falls. After scoring some epic shots, the sun had set, and Austin was frozen cold. Austin got back on land and shivered his way into a dry pair of clothes. After Austin had thrown on his last layer, we faintly heard Ted yell down from the top of the canyon. “I need one more shot!”. Initially when Ted left to position himself high up in the canyon, he told us he was going to try and do a composite shot. He wanted to get a shot of Austin paddle boarding the falls with the stars and milky way in the background. After hearing Ted’s request, we all discussed Austin’s fate and of course, Austin was not keen on going back in after he just warmed up. The longer we discussed, the colder it got. We heard Ted yell down again. With slight hesitation, Austin’s warm clothes came off and the cold, soaking wet ones were stretched back on. Austin went out one more time for the shot. Savage. 7 am wake up call. We got a good night’s rest, despite the below freezing temperatures. Austin, Brandon and I crammed into one tent to keep warm. Ted volunteered to sleep outside because he didn’t want to get anyone sick. He had a one-person tent that he set up on the inflated Explorer Paddle Board. Speaking of Ted’s sickness, it got worse overnight. This was no surprise since he slept in frigid conditions. It became aware to everyone that we would have to cut our trip short for Ted’s sake and head back home after we shot at Mooney Falls. We hiked 10 minutes north of our campsite to Mooney Falls. Mooney Falls was epic. Similar in stature to Havasu, Mooney stood over 200-feet tall, dumping water into aqua-blue, travertine pools. 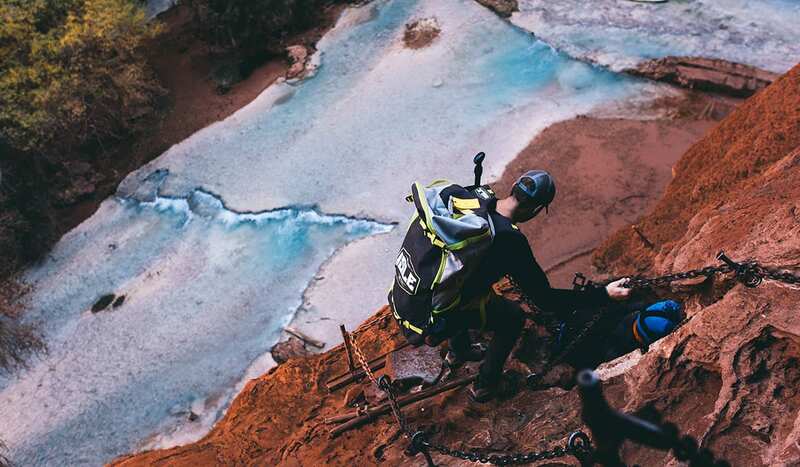 The only way down to Mooney’s basin was to traverse down the canyon’s face using muddy, wet chains and ladders. Getting down to the basin would be impossible with our inflated Explorer Paddle Board. A stroke of genius hit us. Throw it off the top of the falls. I still remember this moment in slow motion. Austin held the Explorer over his head like a barbarian and gave it a good toss into the abyss. The Explorer flew in the air like feather falling from the sky. We all cheered as we traced it’s path down the thundering falls. It stuck the landing. The basin at Mooney was magical. And since we were there so early, we had it all to ourselves. The basin of Mooney was much larger than Havasu Falls. Everything about it was much bigger. The amount of moisture was insane. Even if you stood 50 feet away from the falls, you would still get wet from the falls’ mist. We all rummaged around Mooney falls basin like monkeys taking photos and video while Austin navigated his way across the terraced travertine pools. Mission success. A full day’s hike back to the trailhead seemed irrational since Ted was becoming more ill. The best option for us at this point was to take the helicopter back. 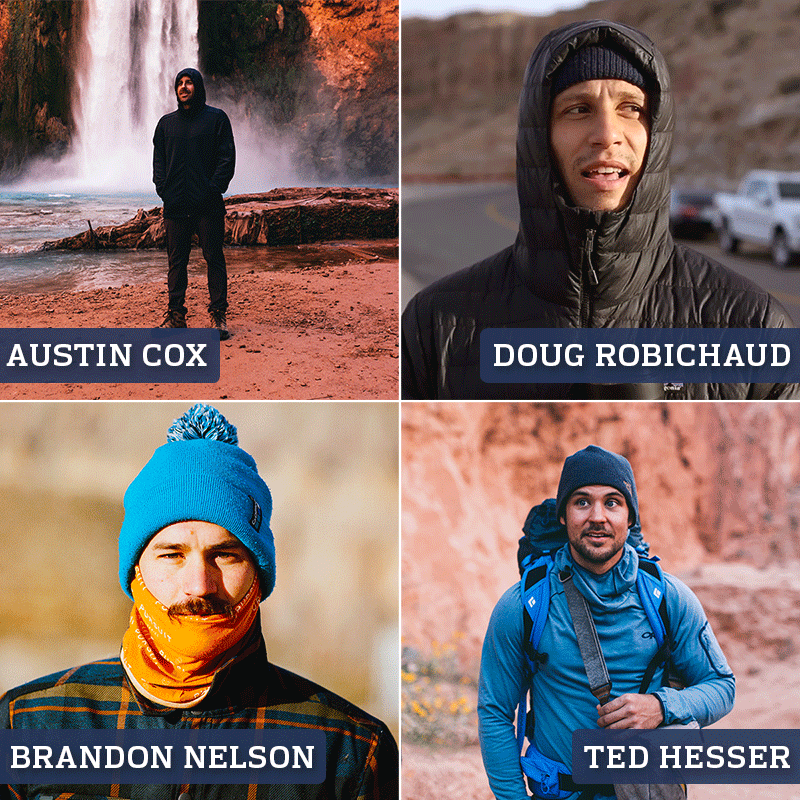 It wasn’t an easy decision since all of us would’ve rather completed the whole Havasupai Trip by foot, but we knew what was best for Ted. After the decision was made, everything seemed to happen in the blink of an eye. We ran across the landing pad where the helicopter was idle, its propellers causing a small wind storm, tossing our hair around as we threw ourselves into the 4-person cab. Seconds later, we shot up into the sky like a rocket, soaring over the Grand Canyon like a pterodactyl did centuries ago. In three minutes, we got back to the trailhead. At the van we got some final bits of footage and then officially called it a wrap. Even though our trip was cut short, we were still on Cloud 9 (Ted was trying to be on Cloud 9). Havasupai Falls was epic and the Havauspai reservation was eye-opening. Like most adventures that come your way, you must roll with the punches. Adventures don’t always go as planned so be sure to adapt to those changes and just keep moving forward. 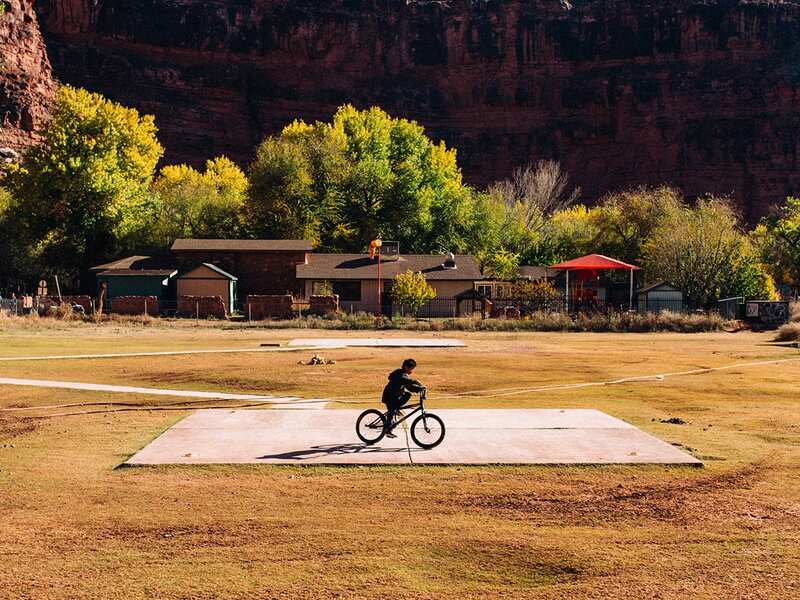 We hope to see you soon Havasupai. Thank you for showing us true natural beauty. Until next time.